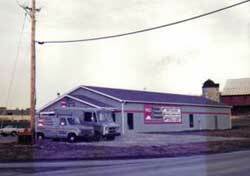 From our humble beginnings back in 1977 moving forward over 41 years, our commitment to quality products, installation, and service has not changed. Personal attention to detail is given to everyone. I personally take great pride in satisfying every customer as if they were my very first. 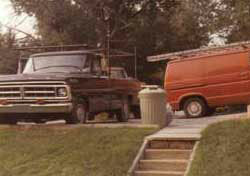 I am grateful to still be a part of our family owned business and helping people like you become part of our family. 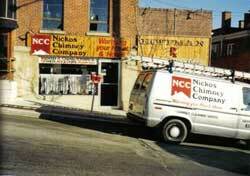 For over 40 years, Nickos Chimney Company has been the areas most reliable, dependable, and honest chimney sweep and fireplace service company. We pride ourselves on treating every customer with the same respect and same dedication. 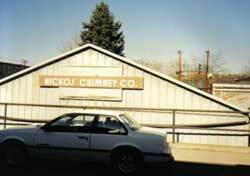 Nickos Chimney Company began with the owner getting his hands dirty – his face, too – proved to be a prosperous entry into business for George J. Spanos. When he started sweeping chimneys in Greensburg over 41 years ago, no one else in town was doing that dusty job. A Monongahela Valley native, he had done restaurant work in Florida, married a Greensburg girl, and started a family, but he was getting nowhere in terms of career. However, he and his wife Joanne purchased a decades-old Greensburg house and it contained – fatefully – six Victorian marble fireplaces. Desiring to make use of those quaint facilities, they began digging into loose bricks and debris, and found lots of mess and mystery. They sought help from masons and roofers, because there was not one chimney sweep in the yellow pages. “Nobody could advise us,” recalls Spanos. About the same time, however, his brother-in-law, Mark Opsitnick, spotted a magazine advertisement selling the notion that you, too, could become a chimney sweep in your spare time. Eventually Opsitnick and Spanos put up $1,000.00 each to buy vacuum equipment, tools, and do-it-yourself literature, and they formed – out of the final syllables of their names – “Nickos Chimney Sweeps". Spanos and Opsitnick set up shop in the garage behind their home on Pittsburgh Street in Greensburg. A purely service business, like chimney sweeping, doesn’t take much capital. But Spanos says he ran into unexpected cost pressure when he expanded into retailing in a tiny storeroom, just 300 square feet, at 13 E Pittsburgh Street, Greensburg. The exposure just off Main Street was great, but the increase in expenses was almost fatal. Retail, Installation and Service are three separate types of businesses. Two years brought not only a profitable turnaround, but also a major expansion. 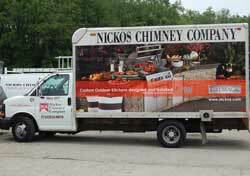 Nickos Chimney Company purchased the last remaining property in the county’s Hempfield Industrial Park, near Donahue and Georges Station Roads. The new showroom, office and warehouse occupied 4,000 square feet, and Spanos foresaw two later phases of expansion. In 1992, a devastating arson fire destroyed Spanos’ business on Georges Station Road. “It was a 10-year setback,” said Spanos, but we had 15 years of customers, so we got back in the truck and started over. “It took about three years for the company to get back rolling again,” and another 10 years to pay off the loss. Spanos and his employees set up shop in his Greensburg home before moving the business to its present location on Route 30 in Latrobe, across from Saint Vincent College. 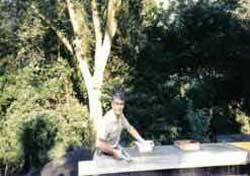 After 40 years, George still evaluates every installation job and prepares proposals for the customers.